while leaders of some 150 countries were negotiating climate deals to curb global warming and climate change in Buenos Aires, Argentina, scientists were busy trying to figure out how global climate will change if the talks fail. Will it be a gradual change from warm to very hot, or a sudden shift in temperatures across our planet? The scientists explored all possible scenarios and came up with a scenario very much possible if we fail to curb emissions of greenhouse gases. According to most scientists, global warming will not be a gentle 'turning up' of the Earth's temperatures, as climatologists used to think, but rather a sudden shift to a new climate system. 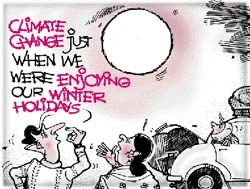 "Climate doesn't change smoothly. It happens in jumps and jolts," says Stefan Rahmstorf of Germany's Postham Institute for Climate Impacts Research. In Buenos Aires, he revealed details of a study that builds on his prediction that northwest Europe could cool by several degrees as global warming shuts down the Gulf Stream. The current has already been weakened by increased flows of freshwater into the North Atlantic, Rahmstorf says. "There is a threshold in the North Atlantic Ocean circulation may abruptly collapse. We may reach that threshold early in the 22nd century but it could be much sooner." While Europe faces a sudden chill, most of the planet could face equally rapid heating. Abrupt climate change was the historical norm, says Jeff Severinghaus of the Scripps Institution of Oceanography in California, usa . Greenland ice cores, for example, have revealed a sudden rise in average temperatures 14,600 years ago of more than 5 c in less than 10 years ( New Scientist , Vol 162, No 2160). "We used to think climate changed gradually, like slowly turning up a dial on an oven," says Severinghaus. "But it is more like a light switch." The abrupt changes may be intrinsic to the atmospheric system, or triggered by feedback with vegetation. Researchers at the Hadley Centre in Bracknell, part of Britain's Meteorological Office, forecast that in the next 50 years, global warming will force forests to grow much faster, absorbing more than 100 billion tonnes of carbon, a third of current industrial emissions. This should moderate warming. But from about 2050, the warming will also wipe out tropical forests, returning the carbon to the atmosphere and causing 'runaway' warming. "We used to discuss these scenarios privately. Now we are being more open," says Stephen Schenider of Stanford University in California, usa . If the climatologists are right, waiting for cheaper clean-up technologies before tackling the problem of global warming would be a grave error. Schneider warns that the rate at which greenhouse gases are added to the atmosphere in the next few decades could be as dangerous to climate systems. Worryingly, the latest data on co 2 , revealed by Dan Keeling of the University of California in San Diego, usa , show that in the 1997, the gas accumulated in the atmosphere at a record rate of nearly 2.5 parts per million (ppm). Bob Watson, chairperson of the United Nations Intergovernmental Panel on Climate Change, says the new work on sudden, chaotic climate change will be the central feature of the panel's third report, due to be published before 2001. Its previous report in 1995 contained as little as just two paragraphs on the subject.